Renewable or “green” power is a term used for the electricity or power that is produced by a renewable or “green” generation facility. 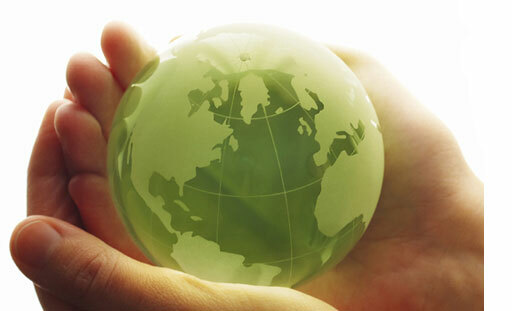 Facilities that minimize or eliminate contributions to green-house gasses and climate change. Facilities that do not add noxious or harmful emissions into the atmosphere. Examples of “green” or renewable systems are hydro, solar, photovoltaic, wind, methane production through land gassification and wave or tidal systems. Lane Electric is one of a group of Oregon electric co-ops who have joined forces to offer “green” or renewable electrity to their members. Annual contributions to the Bonneville Environmental Fund (BEF) have been made by Lane Electric for the research and development of new renewable or “green” resources for many years. 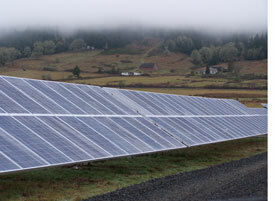 Lane Electric is involved with some of the new “green” projects that have been developed recently. Today, 107 net-metering, photovoltaic (PV) projects have been installed in our service area with a capacity of 575,000 watts (575 kW). These projects have been connected to Lane Electric’s distribution system and have the capacity to generate over 620,823 kilowatt-hours annually – enough electricity to power 34 homes for a year. As well, Lane Electric, in partnership with King Estate Winery and SolarCity, boast one of the largest (1 megawatt) winery-based solar arrays in the United States, generating approximately 1,000,000 kilowatt hours annually. You can also enjoy a high-speed construction video of the array on YouTube. Lane Electric is always interested in looking at and evaluating new and exciting “green” opportunities – among them, wave energy, geo-thermal generation, wind production and, solar generation. Make no mistake, while renewable energy is a good idea, the cost of generating this “green” or renewable energy is higher than the energy generated by the dams on the Columbia and Snake Rivers. 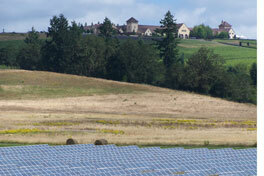 In fact, on a blended basis, green power can cost as much as three times more. Each “block” represents 100 kWh that have been generated or produced from a qualified green or renewable resource, i.e., solar, wind, PV, hydro, etc. Each “block” purchased adds an additional $2 on your electric bill. In addition to your regular monthly electric bill, you will also see a line item charge for “MemberChoice” on your bill. Your monthly bill from Lane Electric will clearly reflect your support of renewable energy. How many “blocks” can I buy? If you are interested, you may sign up to purchase as little as 1 block of “green power” or you may buy green power blocks (100 kWh each) equal to what your monthly average electrical usage is. If, for example, your average monthly electrical use is 1500 kWh, you are eligible to buy up to 15 blocks of green power. Remember, each block of green power costs $2 so using this example, an additional $30 would be added to your electric bill for green power. You may subscribe to as many blocks as you like by completing the Member Choice Request Form. Green Power Brochure 2017 (PDF). To sign up for the Member Choice program, you can return the completed form with your electric bill or call 484-1151 and speak to one of our Customer Service Representatives about signing up. A $.50/Watt rebate for approved residential solar photovoltaic systems up to a maximum of $1,000. A Zero percent (0%) loan available for photovoltaic (PV) and/or solar water heating systems up to a maximum of $9,000 (OAC). NOTE: Other renewable energy systems may qualify. Contact Lane Electric’s Energy Services Department at 541-484-1151 for more details. 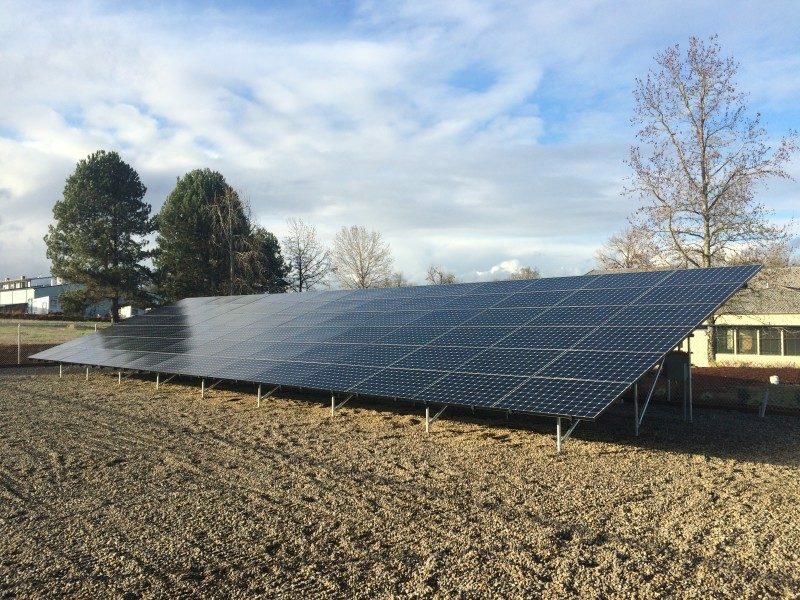 Energized on December 28, 2015, Lane Electric Co-op has “flipped the switch” on Oregon’s first electric cooperative Community Solar Project. The co-op based community solar project is projected to generate approximately 31,000 kilowatt-hours annually which is equivalent to the energy use of two average households in Lane Electric’s service area. Subscription costs for the output from a half-panel is $600 and $1200 for the output from a full-panel. Below are links with additional information regarding the project. Please give us a call at 541-484-1151 if you are interested in signing up.